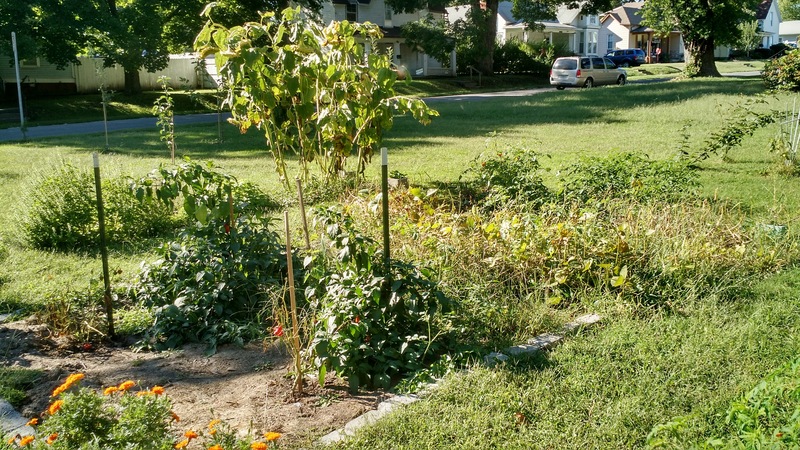 Now that September is nearly over, the garden’s pretty much done for the year. This past week, the highs were still in the low 90s and the sun stayed out, so we ended up turning a few more tomatoes red than I expected to, but overall, we’re in a “down year” for our tomato crop. The corn has dried out pretty effectively, though we haven’t tested the kernels to see if they “pop” as they’re supposed to. The peppers have mostly died out, though the coyame peppers keep on producing. 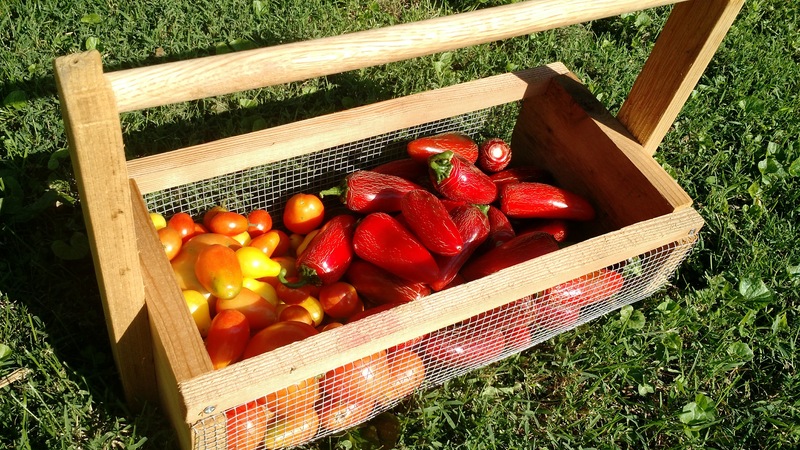 Brooke’s been spending most of her garden time dehydrating peppers, then dicing them up to make pepper flakes (for some unknown, future purpose…). The margaret peppers never really did much, though we did get some peppers off them. The peppers definitely produced, but I just don’t remember getting all that many off the plants. This is probably because margaret peppers are intended as “red” peppers, so I wasn’t picking them in their “green” state. As such, sometimes they’d shrivel up before we’d get to them. The coyames, alternatively, turn red and then stay red for awhile, giving us the time to pick them. Of course, they’re hot peppers, so not exactly the kind of thing I’m going to slice up and slap onto the grill. Oh well. The basil took over the herb garden. 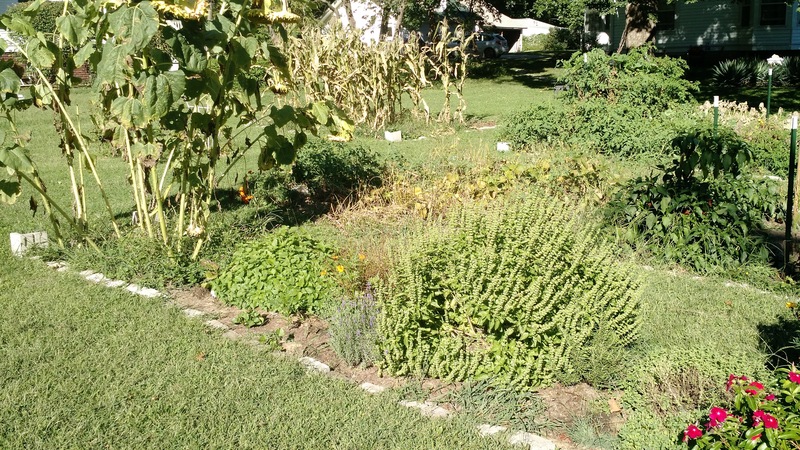 Lavender, oregano and lemon balm are still doing quite well, but weeds have invaded this area of the garden. The sunflowers aren’t looking great anymore, but I think Brooke is planning on using them for something. Overall, I think the “herb garden” was pretty successful this year, though processing everything else has detracted from our use of it. Which is to say, there’s a lot of fresh stuff in there, but Brooke needs to spend more time dehydrating oregano and basil for later use, and less time dehydrating peppers. Still, a good problem to have! We ended up getting access to some “pork ends” from a co-worker of mine. 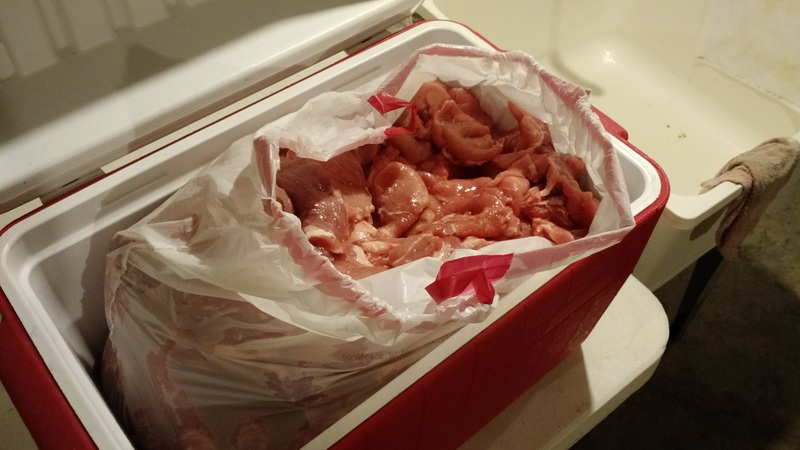 $20 for 60 lbs of leftover cuts. Some of it was definitely better than others, but Brooke ended up grinding 20 lbs of it by hand (then vacuum sealing it and freezing it), followed by some additional portions she saved for cutting up (i.e. various purposes), and lastly the leftover “fatty” portions for rendering. If I recall, she ended up getting maybe 4 lbs of fat off what she saved. It brought back some memories for Brooke, who used to work behind a meat counter. 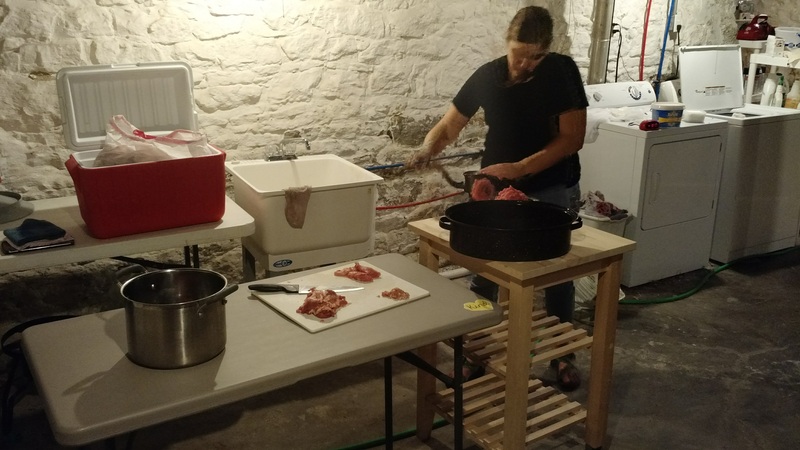 I’m not sure she’d like to do this all the time, but for the money, we ended up getting quite a bit of usable pork to use this winter. I’ve got a few things to cover here, so it may get kinda lengthy… The first thing that bears mention is the bees! 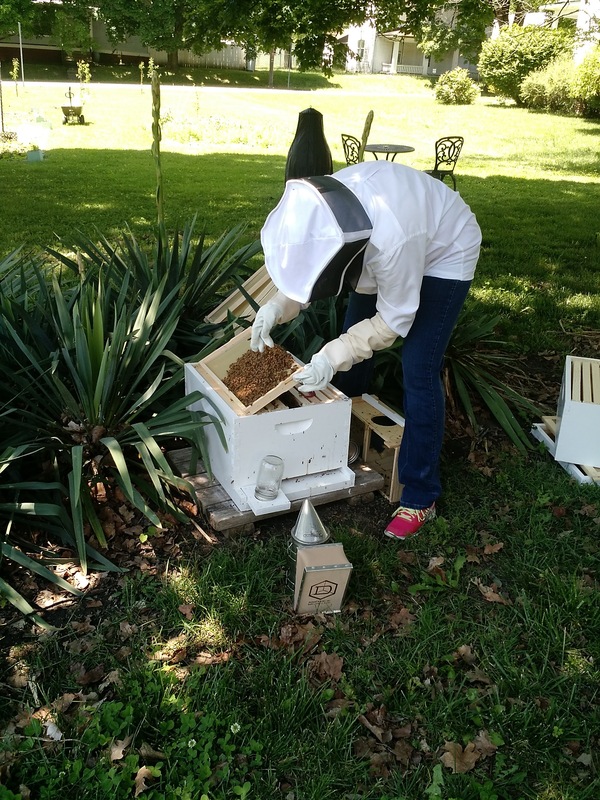 We don’t have chickens here (yet…), but for the time-being, bees will be our means of extending this homesteading venture beyond growing stuff in the ground. Brooke ordered some bees a few months ago and they arrived in early-May. Since that time, we’ve largely left them alone, aside from giving them copious amounts of sugar water to keep them happy until more flowers are blooming. The hives are in the yucca plants underneath our maple trees near the garden, providing them with a decent amount of protection from the elements (more on that soon…). 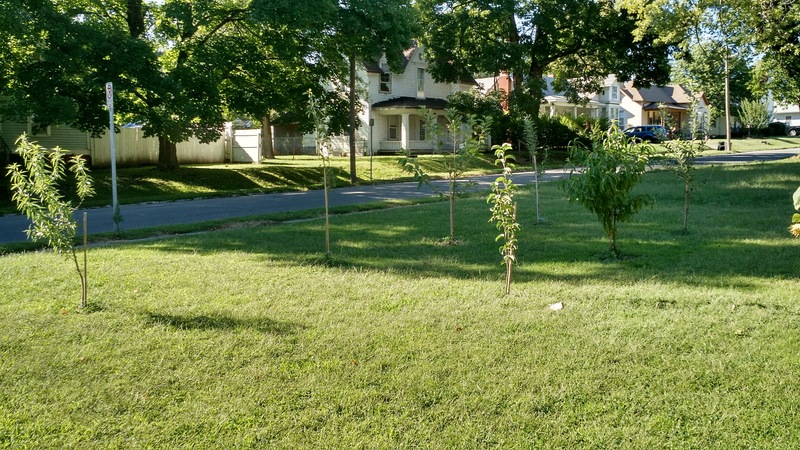 They don’t get a ton of sun, but I’ve trimmed the maple trees a bit to make sure they get it for at least an hour in the morning and in the evening. We’ll see how they do there, but right now, it seems like they get especially active in the early 10:00 hour and remain that way until the evening. In the picture above, Brooke was opening up the hive to make sure the queen was doing her job and, at least a few weeks ago, it seemed like comb was being laid and brood were present, so thus far, the bees appear to be doing their jobs! The house is mostly undamaged, but we’ve got a few estimates coming in to see if we need to do anything. The garage roof needs to be replaced, but we need to look at just how much work we want to put into it right now. 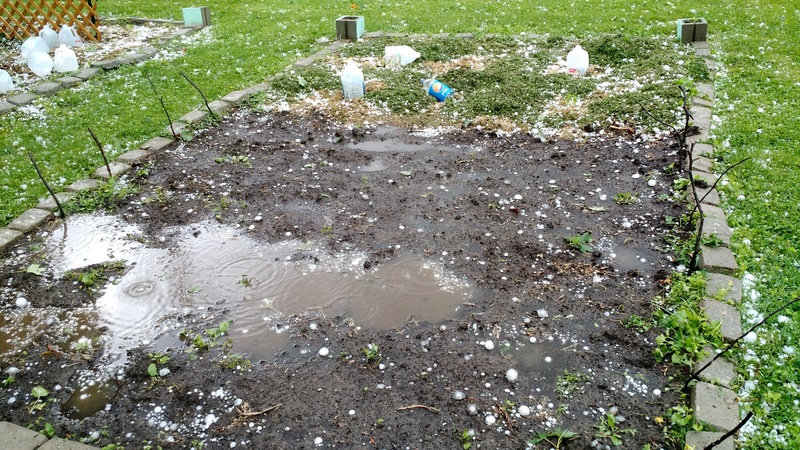 Again, the bees were fine because of their placement under the trees, but the garden got hit pretty hard. 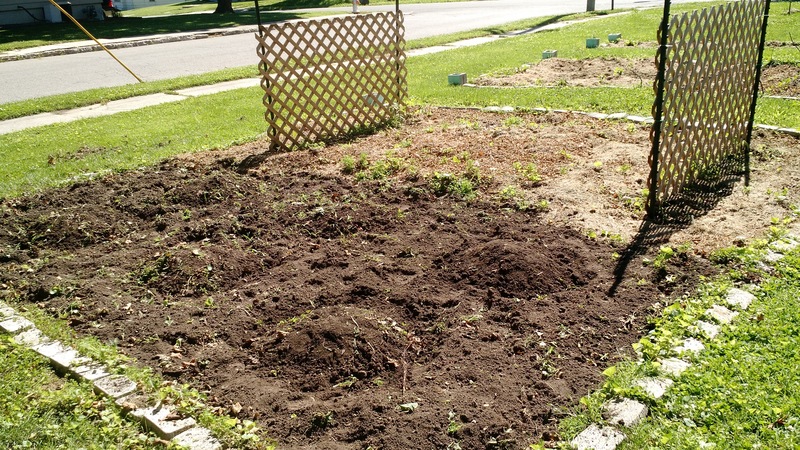 Brooke had just planted green beans, soup beans, and soybeans in the garden plot above, where you see a small ocean forming. 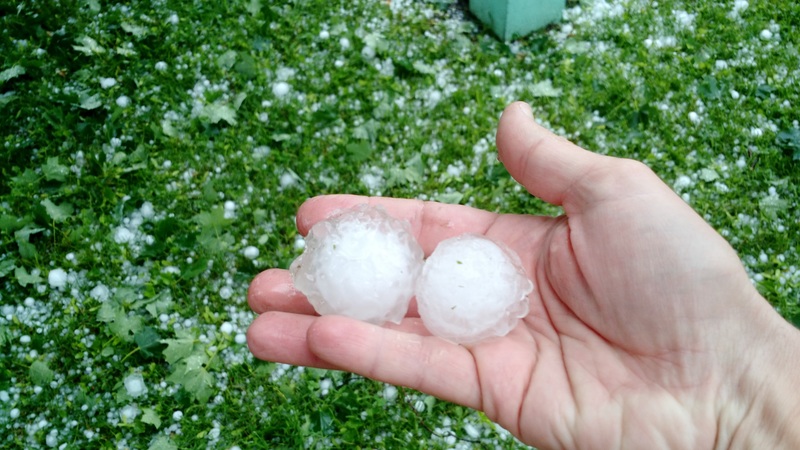 Our tomatoes were mostly spared, but many of the milk jug covers were blown off as the storm came in. 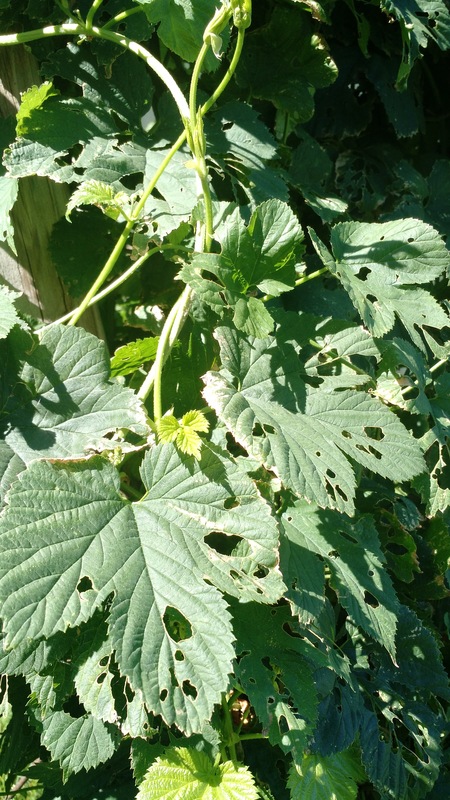 The unprotected plants were mostly decimated, but the ones that remained covered were fine. We lost a few plants, but the rest of them have bounced back pretty well by now. The peas got hit too, as they were probably the largest plants at the time. 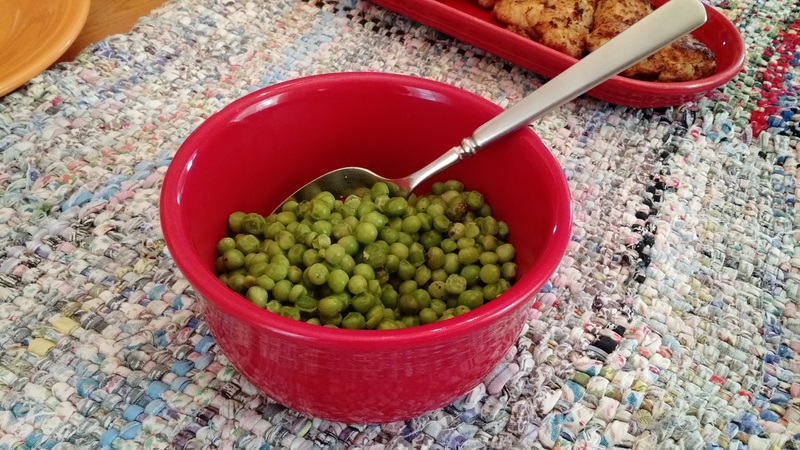 Since then, Brooke has harvested all the peas and pulled up the plants so we can make room for planting popcorn. The entirety of our pea crop. The carrots are looking good and probably need to get pulled soon. Again, the peas and radishes were to the left of the carrots, and we’re going to put some popcorn over there today or tomorrow. The weather looks to be getting pretty hot this week (highs in the low 90s), and no rain chance in sight, so we’ll get them planted and I’ll need to water them in the coming days. 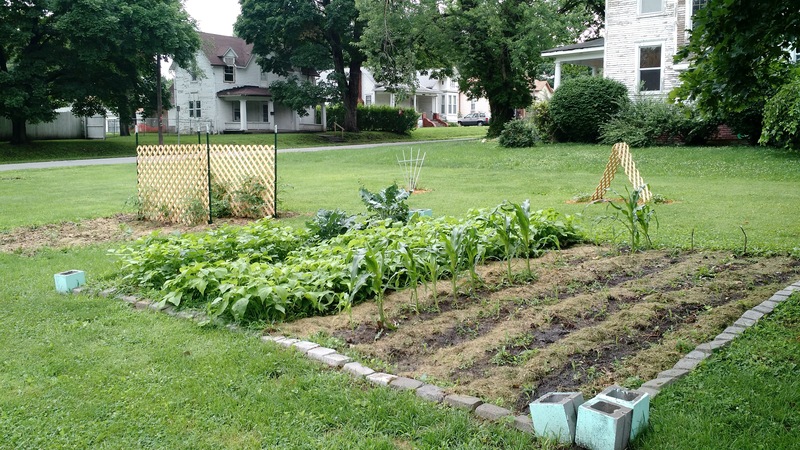 We’ve been gone for the past few weekends, and any available time during the week has been taken up by Brooke traveling, or by rain, so we hadn’t planted the rest of the garden yet. Finally, yesterday, Brooke made some mounds next to the tomatoes where the pumpkins are going to go. 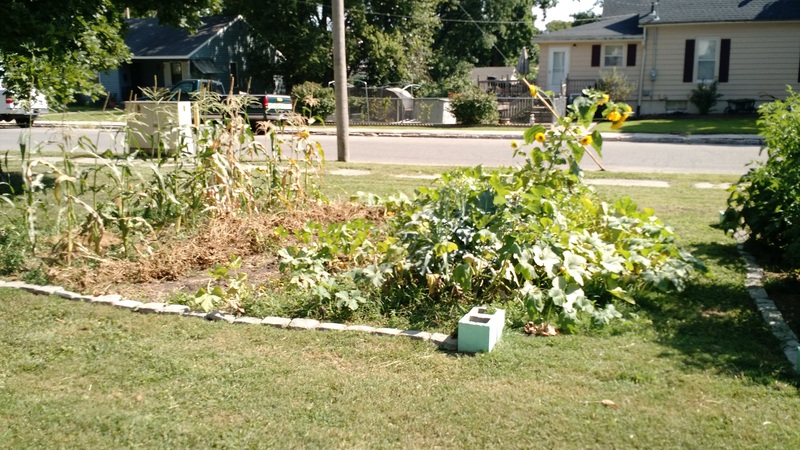 This is a section of the garden that flooded last year, so we’re hoping the mounds keep the pumpkins out of the water better than the corn seeds were last year. Thankfully, the beans survived the hail and flooding from last week! 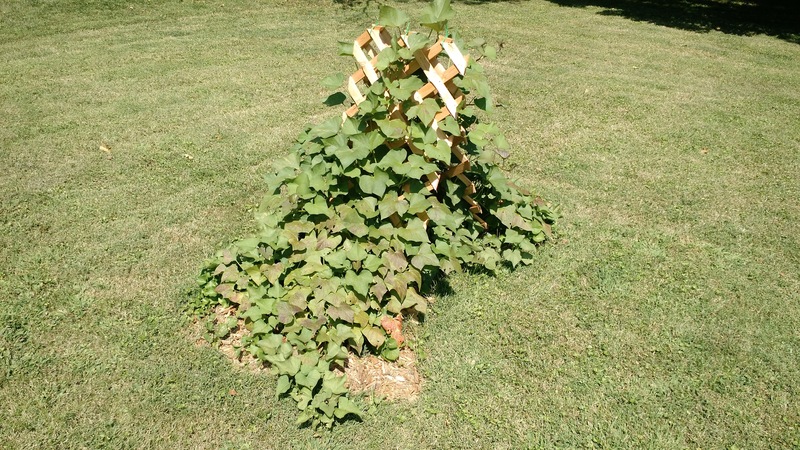 Since then, the green beans and soup beans all popped up and are looking great. The soybeans are moving a bit more slowly, but I think nearly all of those seeds popped out of the ground, too. We’re adding fewer green bean and soup bean plants than previous years because we’ve still got green beans canned from two summers ago. If the soybeans take off, we’ll probably keep using those in the coming years for edamame. 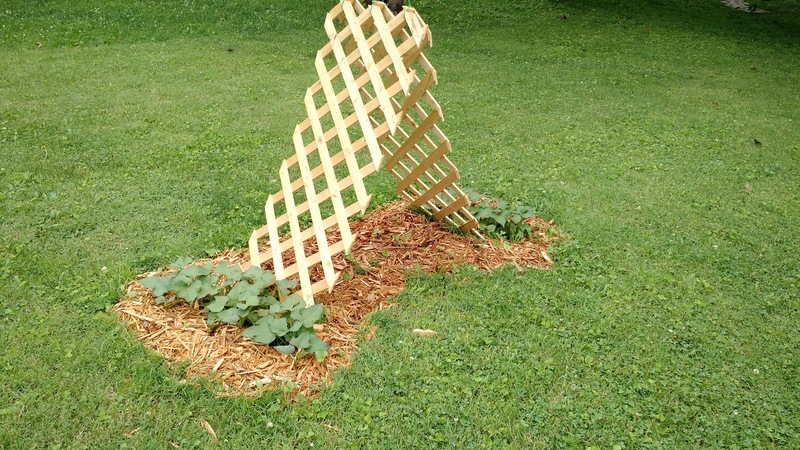 Soybeans are good nitrogen-fixing plants, so we’ll rotate them around the gardens to maintain good soil health. The herbs I planted in the plot in the background are kinda growing, but not all that well. 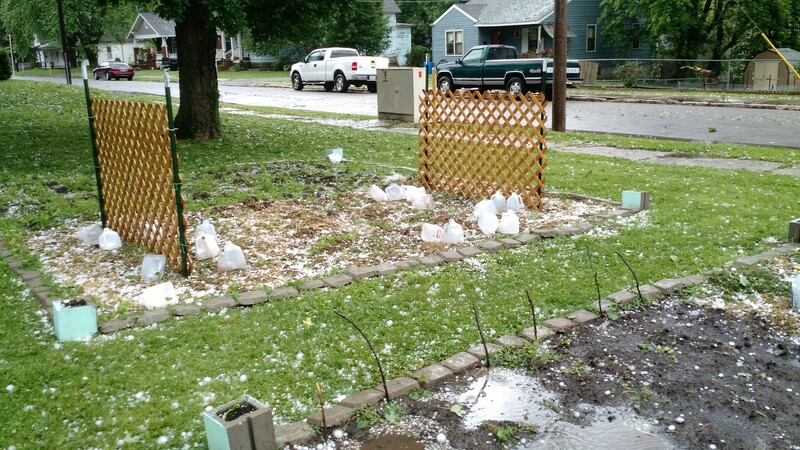 Many of them got hit hard by the hail and a few of them weren’t looking great when we put them in the ground. We’ll just have to see how they turn out. 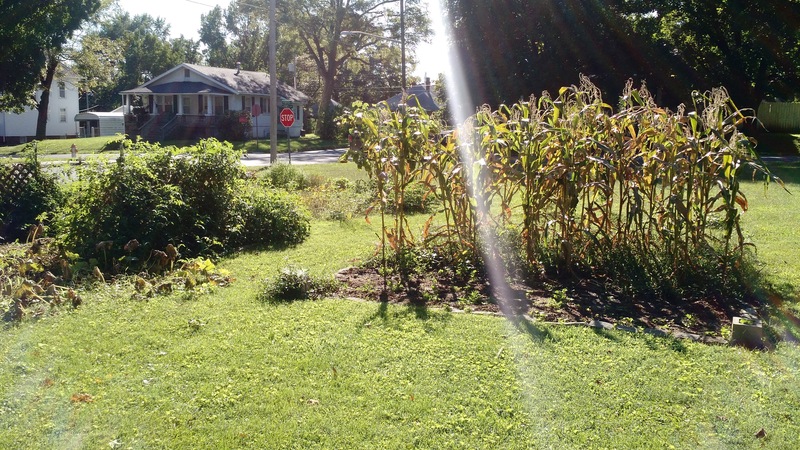 In the extra patch to the right, Brooke planted some sunflowers yesterday. The bees will like them, too! 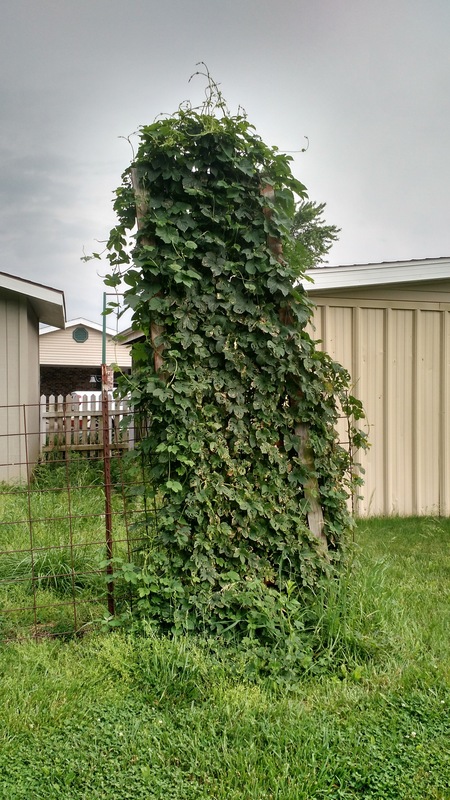 Lastly, I wanted to mention the hops we’re growing in Hannibal. Clearly they’re doing as well as they usually do! Mark and Diana got us a nice new vacuum sealer for Christmas this past year, so we’re looking forward to harvesting and saving some of these hops once they’re ready, hopefully earlier than we tend to harvest them. Unlike previous years, though, it looks like somethings chewing on the leaves. I didn’t see anything obvious on them, but the evidence is pretty clear. 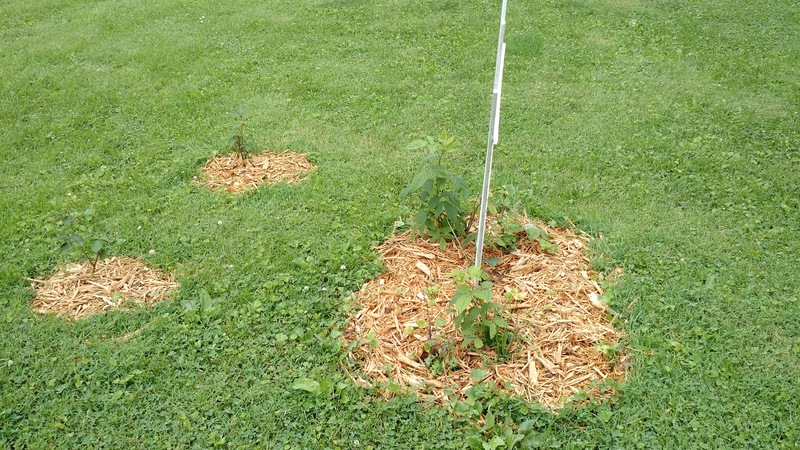 I’m sure Mark will keep an eye on them, as he planted some new fruit trees near the hops, so he’ll be out there checking on everything frequently. I know it’s been awhile since I posted anything, but this particular post has been bouncing around for a bit and I didn’t want to jinx anything. So far this season, “sickness” has passed us by. This isn’t to say we haven’t felt ill or anything, but the week-long, knock-out D.B.D. that we tend to experience each Winter has, thus far, eluded us. 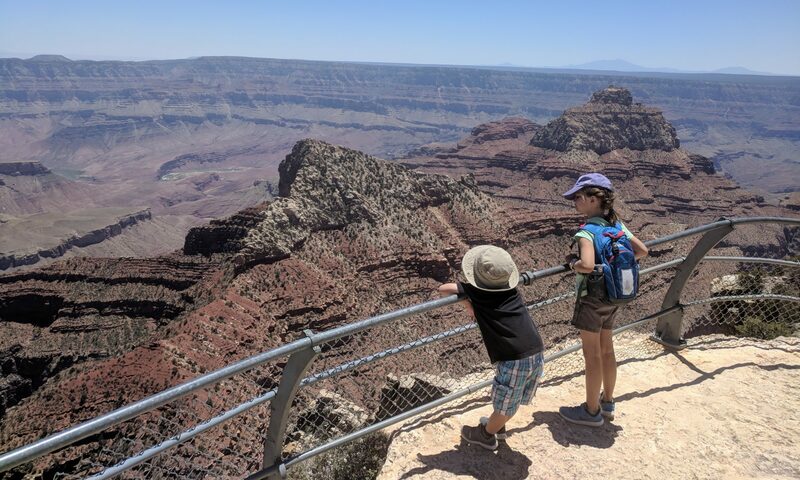 Meg had a bout of strep throat two weeks ago that kept her out of school for 3 days, but the antibiotics took care of it, and really, by the third day, she was back to normal and just couldn’t go to school. Calvin, somehow, hasn’t really come down with anything. He’s had a lot of gunk in his eyes the last few days, but that’s begun to subside. It was probably connected with the runny nose he’s had, but again, nothing to keep him from school. Thus far, he hasn’t missed any days because he’s been sick, which is craziness compared to the last few Winters. I can only assume that he’s been infected by literally all childhood diseases at this point and he’s now built up an immunity. Regardless, we’ve been pretty good on the illness front. Even Brooke and I have resisted sickness pretty well, with the exception of the odd runny nose and headache. The weather is the other story of the season, where we had a high of 72 F yesterday. On February 20th. In Missouri. It was nice enough late this week that I pulled out the bike trailer and hooked it up to take the kids to the park on Thursday and Friday (pictured above). 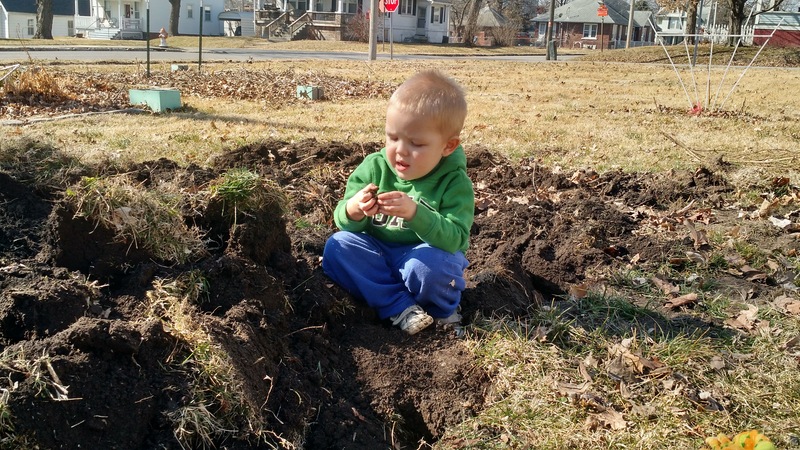 Yesterday, since the sun was out and the temperature broached the 70 F mark, we went out to the garden and started working the soil a bit. 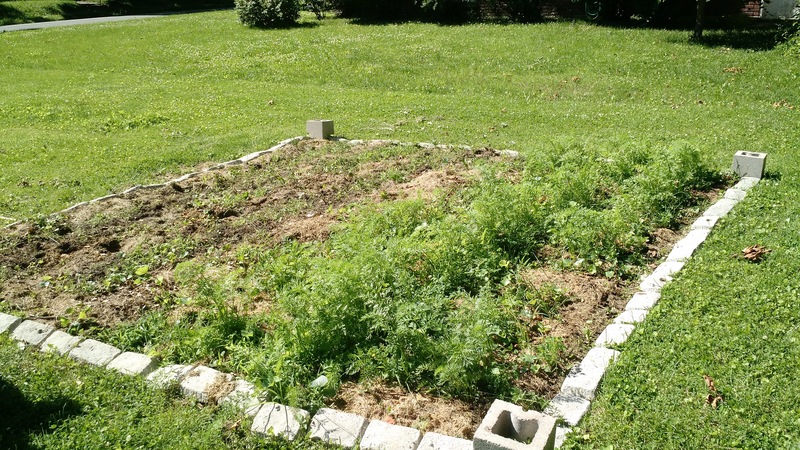 Brooke went ahead and started on the new garden plot, a third one to complement the other two we made last year. She nearly completed it too, as the ground was soft enough to work efficiently and turn it over in a few hours that morning. I turned over about half the old, large plot to prepare the way for some carrots, radishes and peas Brooke wants to get started with. The weather should be in the 50 F range this week, so while it’s going to get colder again, I’m hopeful I’ll have at least one warmer day over Spring Break in a few weeks so I can get out there and turn over more of the garden. It’s mostly herbs. I promise. 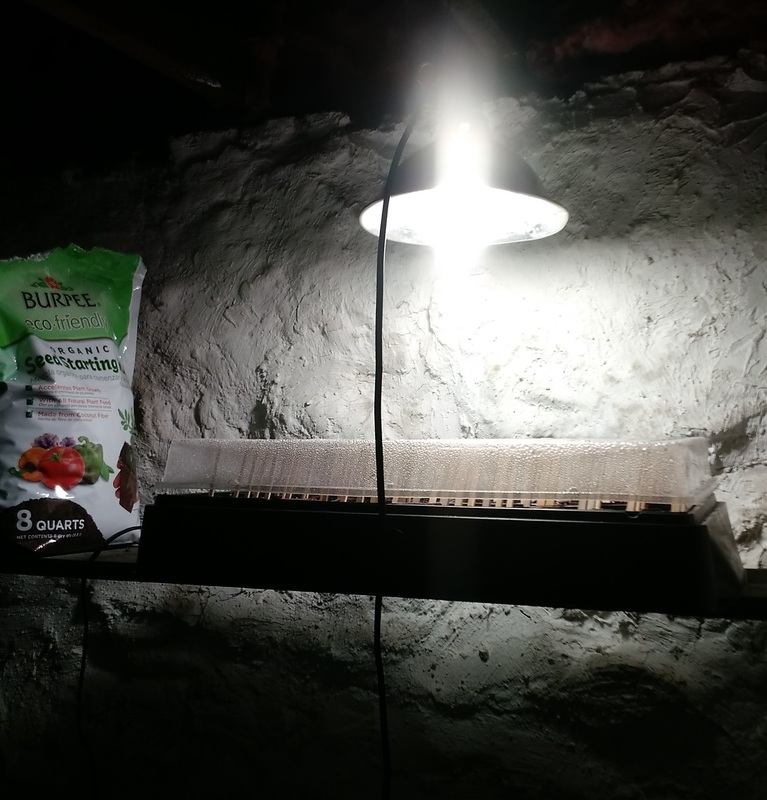 For now, Brooke started up her seed warmer and a lamp down in the cellar. So far, she’s got mostly herbs planted, as well as peppers, tomatoes and some flowers. This is a bit sooner than she started them last year, and we had them on the back porch last year, where the temperatures got a bit hotter earlier than we expected. Hopefully, the cellar will maintain it’s temperature better and the seeds will be a bit happier. Feels like Spring is just around the corner! …even Brooke has used it! Last year, I started jogging regularly at the student center next door to my building on campus. 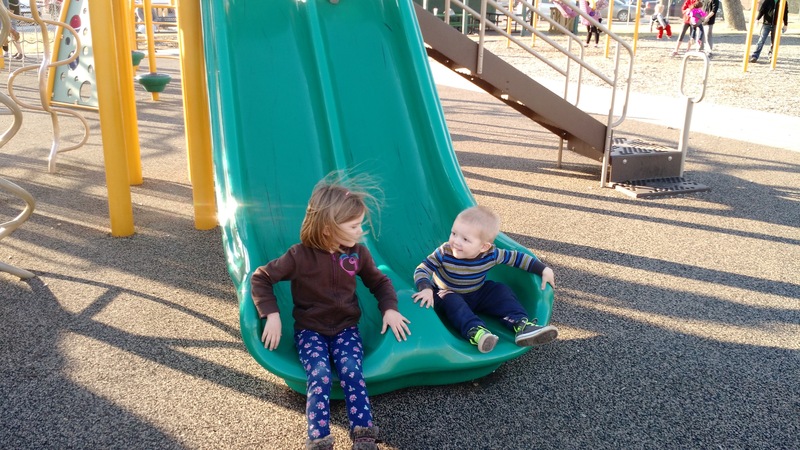 At the time, Meg was still at the preschool, so I could stop what I was doing at 3:00, go over and jog on the treadmill for 20-30 min, and then get home to do a few things and take a shower before getting the kids. On a whim in mid-December, I did a quick survey of Amazon to see what they had in the bicycle trainer realm. A buddy from St. Louis had one that he used for his road bike in the winters, but until recently, I hadn’t really considered it. Turns out they’re actually pretty reasonable! We already have good bikes and have invested in a roof rack for the Forester, as well as a trailer for the kids to ride in, so it made sense to continue in that vein toward biking. 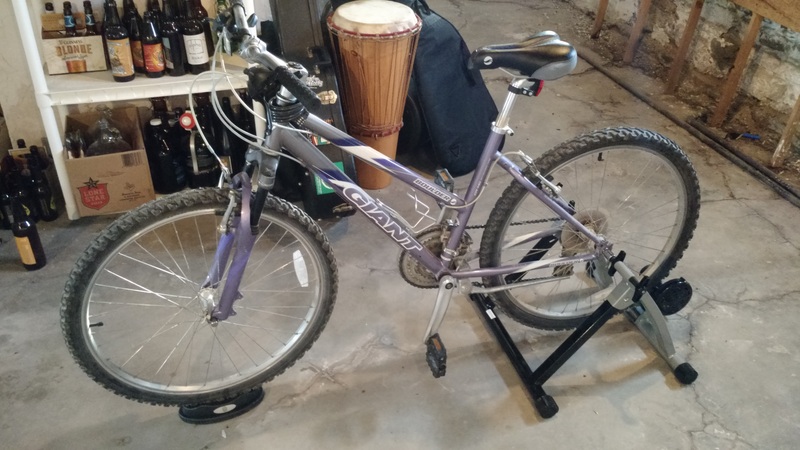 What’s more, it’s compact enough that it, and a bicycle, can fit in our basement without much fuss, though it’s also collapsible and easily removable from said bike if we need to move it. This particular model from RAD Cycle is a touch on the noisy side, and reviewers pointed this out, but many of them were talking about using one in an apartment when someone lives below you. In our case, it really doesn’t disturb anyone, as it’s resting on a concrete foundation. You can hear it on our first floor when someone’s using it, but with the heater running as often as it is, it blends in pretty seamlessly. The noise comes from the mountain bike tires rubbing up against a magnetic resistor. If we were using a road bike or had hybrid tires, I bet it wouldn’t be quite as loud. I’ve been using it the past few days for 20 minute stints in the afternoons after getting home. Brooke has tried it a few times in the morning and hasn’t quite made it to 20 minutes yet, but she’ll work up to it. We’re using her bike on the thing to make it a bit easier for her to hop on it. Also, she’s less likely to use her bike outside as the weather (eventually…) gets warmer, so mine’s available to pull the kids around in the trailer if need be. Hopefully we keep it up. I need to put in more than 20 minutes to really do much good, but for now, that’s 20 minutes of sitting down doing nothing that I’m now using for exercise. I guess that’s progress enough. I’ve completed 3 semesters in my teaching career now. Four, if you count the summer class I taught last year. At any rate, I’m starting to feel more like a pro that’s been doing this for awhile. This semester, I taught my regular stable of Fall classes: Anatomy & Physiology (A&P) I, A&P II and Principles of A&P. These are courses I’ll be teaching every Fall, unless we need to shift things around due to the number of students heading in. This coming Spring, I’ll teach A&P I again in a double-size class. I’ll also teach A&P II, which is normally a Fall-only class, but because of scheduling conflicts this past semester, we’re going to offer it again. The newbie will be Environmental Science, which I’ve never taught but am looking forward to. It’ll be a bit more discussion-based than what I’ve taught thus far, allowing a bit more flexibility in how I approach the material. The main reason I write this, however, is because I feel like I’m finally getting things down into “well-oiled machine” mode. I didn’t feel nearly as stressed out this Fall with getting my final grades completed and turned in. I think I had my three classes turned in before most of the rest of the department did. This is likely due to the consistency between last year and this year, where the grades for most of the exams were nearly identical (within 0.1% of last year’s averages). There were some differences (the Final didn’t go as well this time…), but for the most part, everything this semester went very similarly to last semester, making it a bit easier to chart out the course of the past few months, knowing how things would ultimately end up. Now, I’m off for another 3 weeks before school starts up again in mid-January. I’ll have Meg home with me for 2 weeks while she’s off from Kindergarten, so that’s something of a change from last year. Calvin will hang out with us for a few days in there as well, but he’ll be back full-time around when Meg goes back, leaving me with a little prep time by myself for the upcoming semester. Effectively, I’ve got most of my semester plotted out already (because they’re classes I’ve not only taught before, but just taught this past semester), but Environmental Science is a wild card that should mix things up a bit. I’d like to try and set it up with a series of “debates” that the students carry out (for example, “pros” and “cons” of the most recent international climate agreement), but as I haven’t actually taught the class before and that’s an activity the other professors who teach it aren’t doing, I figure I should get my feet wet before trying something like that. Still, I’m looking forward to trying something new. Before then, I’ve got some Christmas Break to enjoy! I’ve got a few posts rolling around in my head but, frankly, I just haven’t had much time recently. Midterms were a few weeks ago and I gave 3 exams last Friday, so now that I have a window of downtime, here’s the last bit of updating for the garden. Brooke gave up on the tomatoes weeks ago, after she crossed the at least 40 pint line for tomato sauce. Seriously, that last batch of tomato sauce she made was a slog – I could tell she was totally done with tomatoes for the year. But at the time, we still wanted to wait for the sweet potatoes. Finally, just after Halloween, Brooke pulled out the potato crop to see what we ended up with. Not too bad, but I don’t think we got as much as we did in Iowa. Still, for our purposes, it was still a pretty good haul. We haven’t tried eating any yet, but have no reason to think they won’t be solid. Brooke’s busy processing pears from my aunt and uncle’s house, so these things aren’t exactly a priority. Still, just wanted to post this for posterity’s sake. We’ll probably plant some again next year, so we want to remember how many we got this year! A beautiful day for a party! Over years in St. Louis, Brooke and I found that we enjoyed “hosting,” whether that was for church small groups, family gatherings, or for parties. Up in Iowa, we had our first Oktoberfest party largely because we lived in the middle of nowhere and we rarely had visitors, so we organized a gathering of mostly work friends for a cold and rainy evening. Flash forward to 2015, now with two kids and still with a house that doesn’t get visitors (aside from family) all that often. At this house, though, we’re a bit closer to other people (including family) and we also know more people from work and the neighborhood. In an attempt at celebrating our German heritage and the end of our garden’s growing season, we organized another Oktoberfest, hopefully the first of many. The weather ended up being perfect. Seriously, it couldn’t have been any better. There was a chill in the air, the temperature never broke past the low 70s, and the fire was actually useful instead of just decorative. We started the party at 3:00 pm to make life easier for the folks with kids, as we didn’t know how late this thing would go and we didn’t want people to come for dinner and then leave an hour later because it was bedtime. We had a little over 30 people over during that period of time. Quite a few kids were there, and most of the folks were from Missouri Valley. We had a few neighbors come over, as well as one of Meg’s friends from her old school, so she had a pretty great time. Brooke made potato soup, pretzels and sausages (we ran out of the latter, despite Brooke wondering if we bought too many! ), and other folks brought desserts, dips, beer and more. Speaking of beer, I made a German Alt and a Bavarian Hefeweizen. A few over 20 bottles were had, as well as some of the other domestic offerings we provided. All in all, we had a lot to recycle after the party was done! Ultimately, I think people had a good time. It didn’t go as far into the evening as I’d hoped, but we had people there for over 4 hours, so considering when the event started, that was probably long enough. As kids get older and as we meet more people around here, I bet that’ll change a bit. 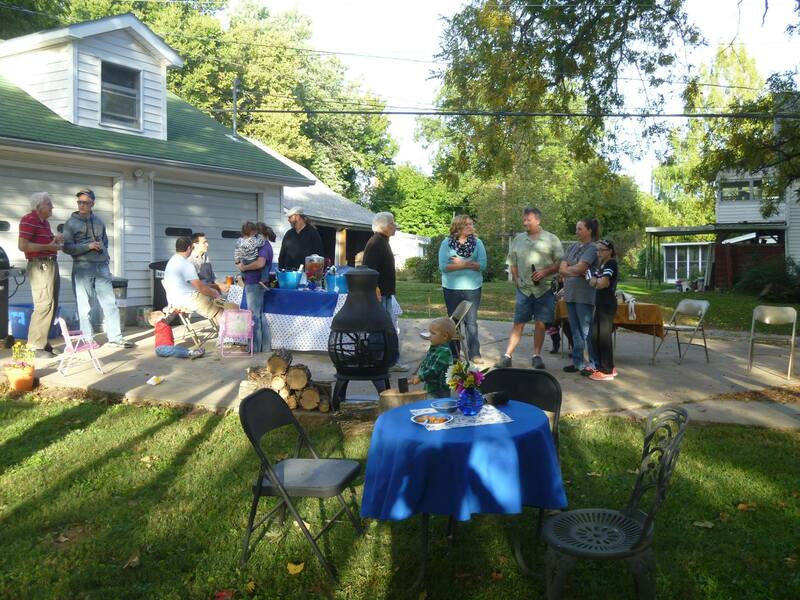 Still, I think the party was a success and we look forward to doing it again next year! Yeah, I know, it’s technically September now. Whatever. The main garden has looked like this for a few weeks now. Brooke pulled out the green beans a few weeks ago and the corn has been done for awhile (we ended up with 24 pint jars, a few quart-size bags we gave to others, and a decent amount we could eat on at dinner – not bad for a first year). 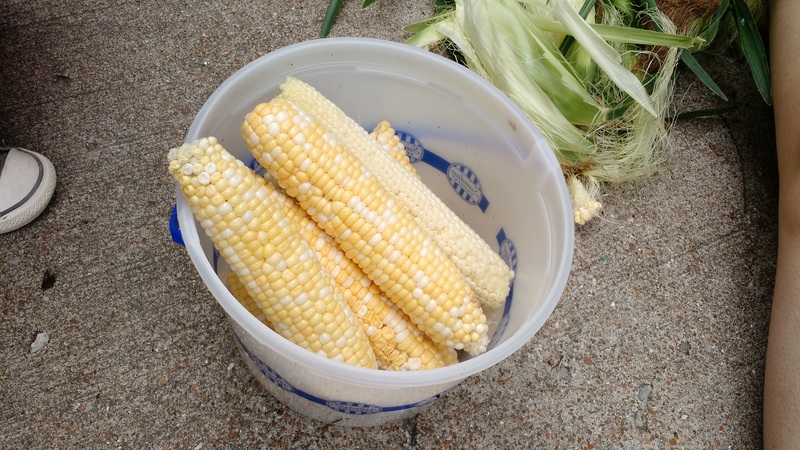 We didn’t end up with much corn, sadly. Some of the ears were actually pretty good, while others were under-developed or pre-chewed by insects. In total, I’d say we had less than 15 ears out of our 3 rows of corn. Some of the plants never quite finished up. The ears we did get tasted sweet, yet the overall texture of the corn was a bit tougher than we’d prefer. Still, Brooke turned it into a corn casserole and it was absolutely edible. Not the greatest, but functional. The pumpkins also finally did something. 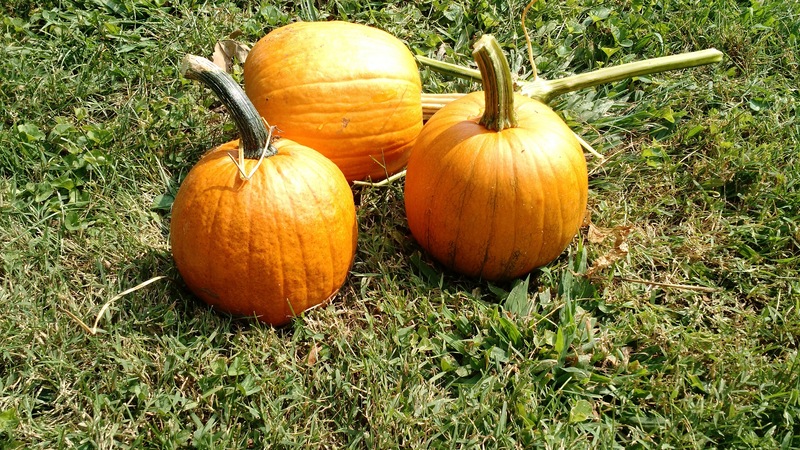 Brooke planted pie pumpkins, so they’re smaller than regular, Halloween-style carving pumpkins. So far, we’ve got 3, with at least a few more still green on the vine that we’re nursing along. No word on how they taste, but we wanted to pick them because a). they looked done, and b). 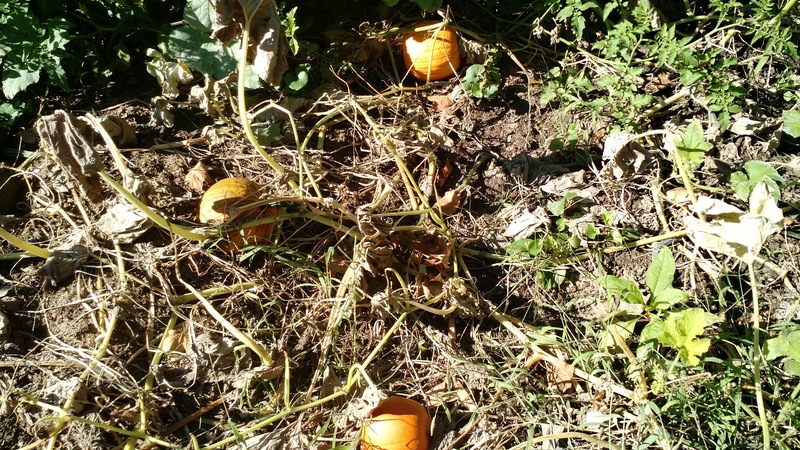 beetles have started showing up, so we were afraid they’d chew into the stem and ruin the pumpkins. We’re thinking pumpkins are a safe bet for future planting, and had we planted them sooner (and watered, like, at all), perhaps we’d have even more. We’ve had to keep trimming the tomatoes to limit their growth. 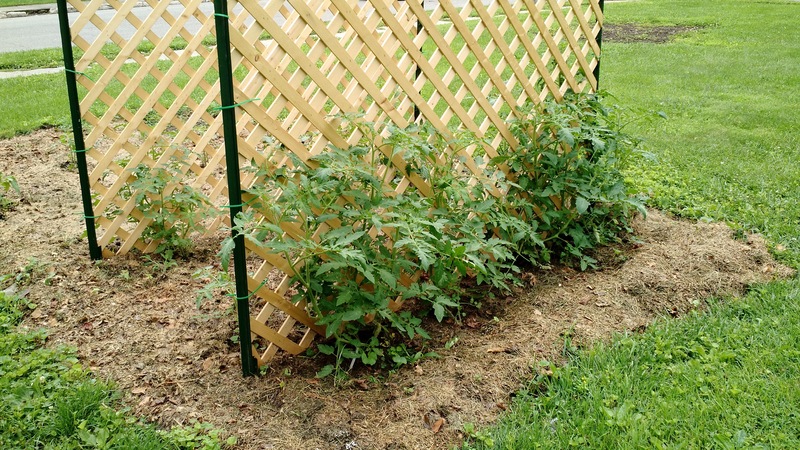 I think our trellis system has worked pretty well, but putting the trellises close together has meant that it is kept pretty shady in between them. 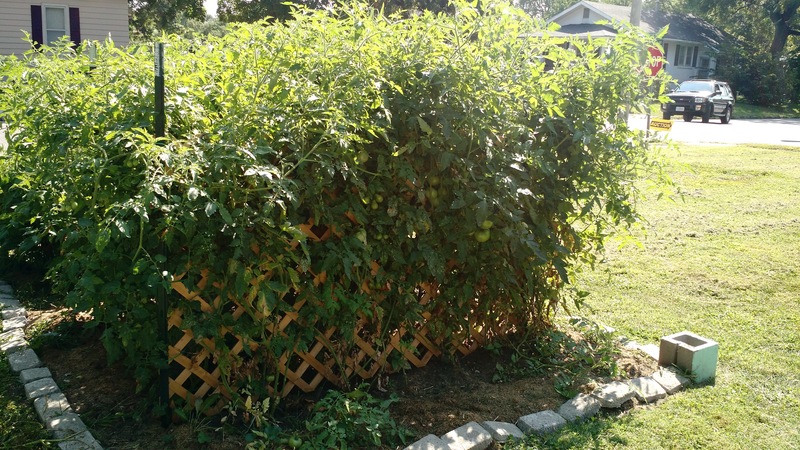 I’ve trimmed them since this picture was taken, so more tomatoes have started finally turning red. Not a ton yet, sadly. 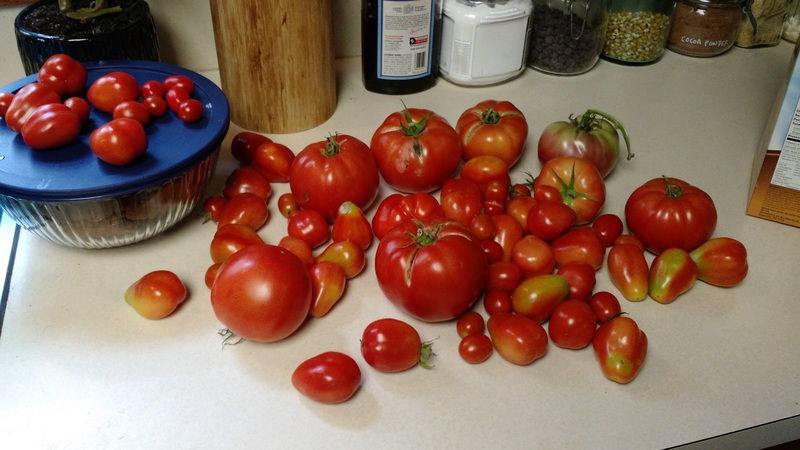 Don’t get me wrong, we’ve got a decent number, and we’ve had more than a few good slicing tomatoes. We just haven’t had a huge number of them develop all at once to make it worth Brooke fire up the oven to process and can them. 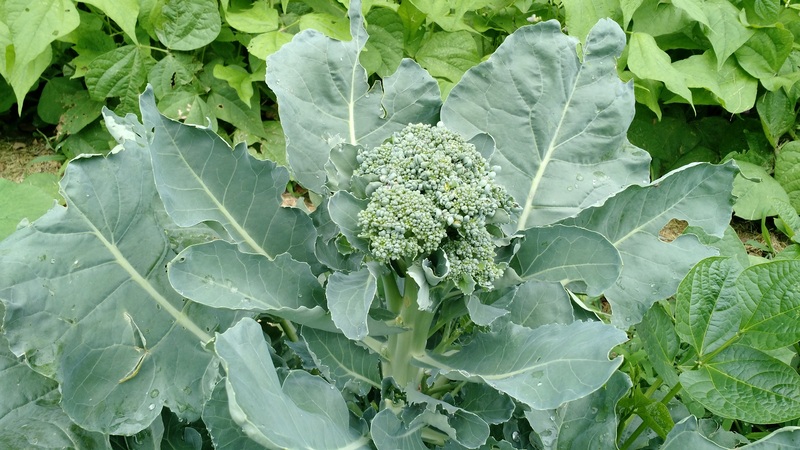 We’ve got lots of little tiny ones still, too, which are great in salads and eating individually, but again, you don’t get much sauce from them. We’ve been trying to water them a bit more judiciously in hopes of keeping them alive long enough to keep developing. One thing worth mentioning, for posterity, is that we were able to turn our A/C off for the last two weeks. You know, prime tomato-ripening weather? In August? Yeah, didn’t have much of it. Lots of green tomatoes and no hot weather to turn ’em red. Thankfully, it’s 90 F outside again, and it should remain that way at least through this week. I was just out there watering and saw quite a few more red tomatoes, so perhaps we’re finally getting to the point where we’ll get something out of it. 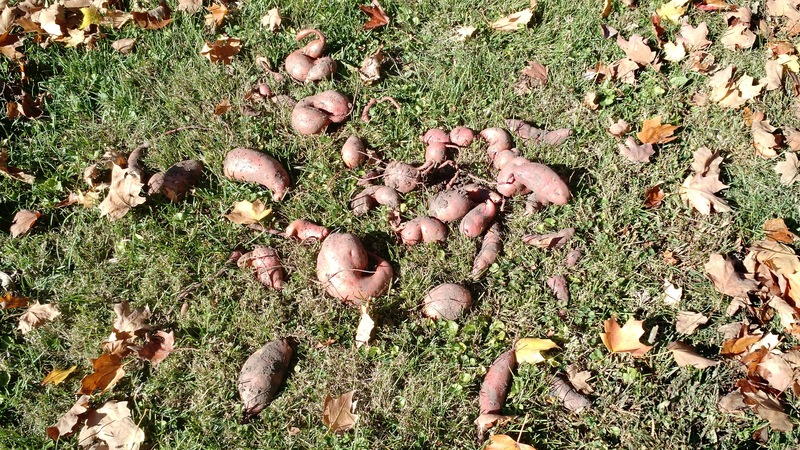 Lastly, the sweet potatoes are still truckin’ along. 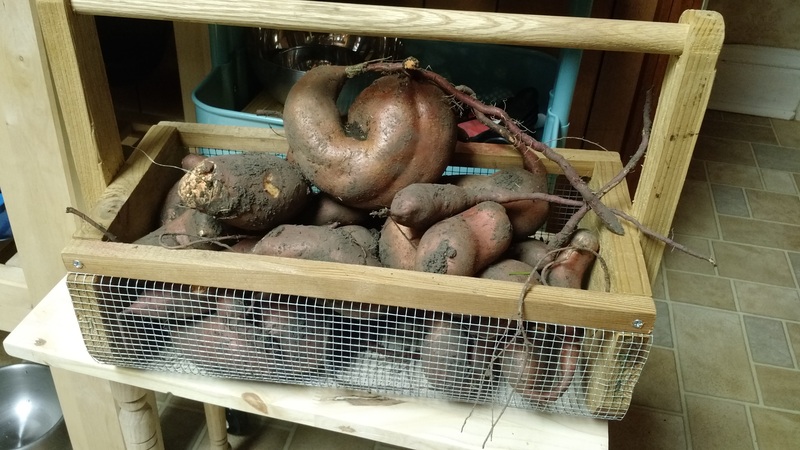 No actual sweet potatoes to show, but the plants have certainly gotten larger! 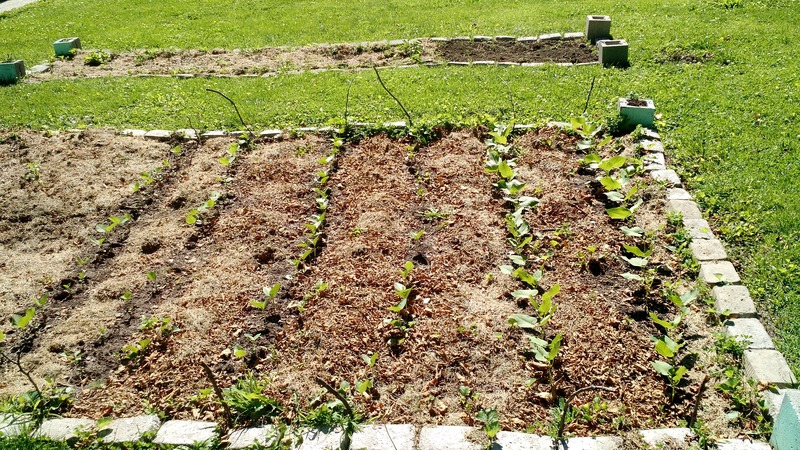 Also, the green beans and soup beans are coming up well, with buds on the green beans already. 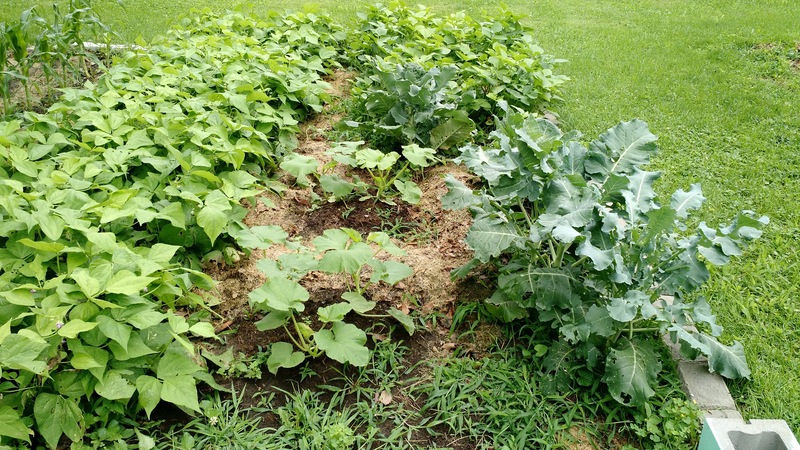 From left-to-right: green beans, pumpkins, broccoli. Soup beans in back. In the middle of the shot above, Brooke’s got some pumpkins growing. After the massive rainfall, they actually took off surprisingly well. She’s got 6 pumpkin plants in right now, and obviously they won’t be making much for awhile. The tomatoes are coming in pretty well, too. Really, the one side is taking off, while the other (in the back) is moving a bit more slowly. The ones in the forefront were in the ground sooner and were also larger when they went in, so it isn’t surprising. More impressively, this is the first time we’ve successfully grown tomato plants from seeds. Brooke got them started on our back porch months ago and they’re doing pretty well! We’ve also got flowers on at least one plant. I suspect we’ll have them showing up on more soon. We’ve done our best to ensure that Meg and Calvin don’t get pigeon-holed into gender-specific stereotypes. That is to say, “princesses” were largely avoided for the first few years of Meg’s life (can’t avoid them now). We avoided pink clothes and toys for Meg early on (again…hard to avoid…). There were some toys that Meg fell into, like “Julia” (her doll that she was inseparable from for a few years), that weren’t exactly “gender neutral,” but we also made sure Calvin had a doll to play with (which he largely hasn’t). The idea was to allow them to choose the toys they want to play with without filling their rooms with princesses and superheroes, respectively. Weirdly, though, Calvin likes cars. Always has. Our house is near a relatively busy road, so shortly after he started walking, he made his way near that street. 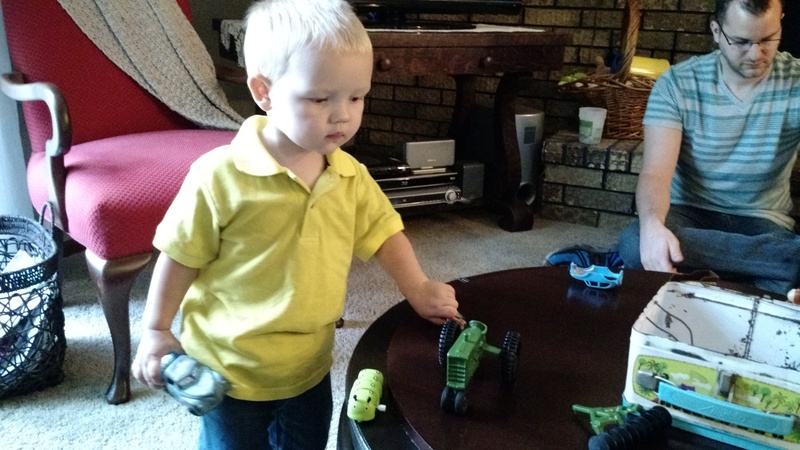 One of his first words was “cars,” followed shortly thereafter by “trucks.” Many afternoons, waiting for Mama to get home, Calvin and I sat on the corner waiting for her to drive up, listening for cars about to come up over the hill. Since then, he’s liked playing with toy cars (including two small ones he fell asleep with tonight), he likes watching rally car racing on YouTube, and he’ll even watch me play Gran Turismo 6 with a PS3 controller in his hand. It’s just one of those things we think about. With Meg, she’s started gravitating in the direction of princesses slowly over time as she’s met new friends, so now she has an interest (recently because of Sofia the First). But Calvin’s one year old, so he doesn’t exactly have meaningful conversation about whether an STI is better than an Evo. So is it inherent that boys must like cars? Maybe. I guess there are just some things “gender neutral” won’t work for.